← Aug 13 BBQ at Locarno — thanks for making it a success! Earlier this month, SKABC members Darlene Heath, Steve Best and I delivered and put in place 5 picnic tables at 4 of our 6 Howe Sd sites. Mick Allen had also helped on the project, but was not part of our delivery and installation crew. The tables are cedar and, including delivery and RSTBC official brown stain, they cost about $150 each. The low cost was not due to poor materials - every board is through-bolted with substantial galvanized coach bolts - but is largely due to the lumber being "free" i.e. re-purposed house decking. It was more work to be sure - but durable, we hope. It gives some additional satisfaction to know this usable lumber did not go to the landfill/chipper/composter, unlike so much other used lumber. 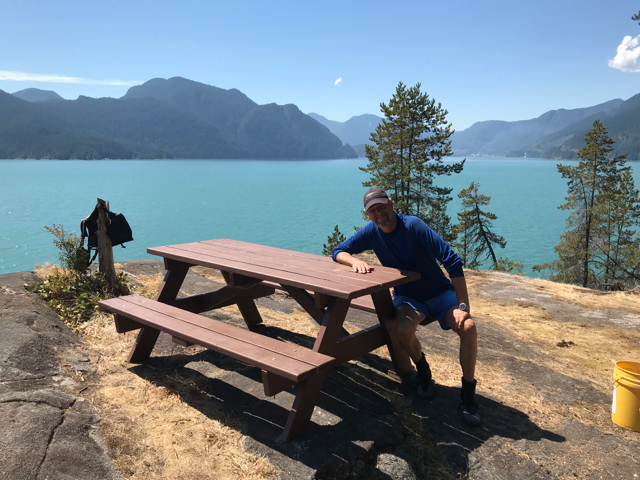 So each Sea to Sky Marine Trail (STSMT) site now has a table except Islet View, which seems too small for one, unless we can brush out more area. Zorro Bay has 2 tables - one at the main N beach and one near the the S beach. Tantalus Landing has, of course, the superior Randy C mega-table. Owned my first kayak at age 15 and still paddling, but evidently I'm a slow learner! Always needing more help for BC Marine Trails Network Assn and for conservation efforts here and there. This entry was posted in announcement, conservation. Bookmark the permalink. Way to go you guys! Need help in future? Just post it!